The lamp is fashioned in four parts: a dome-shaped base with rolled foot covered with a green-splashed straw-colored glaze; a tall, dark green-glazed fluted stem; a wide amber-glazed shallow dish supported on the stem; and an amber-glazed stemcup mounted within the dish. The earthenware is fine grained in texture and pinkish white in color. 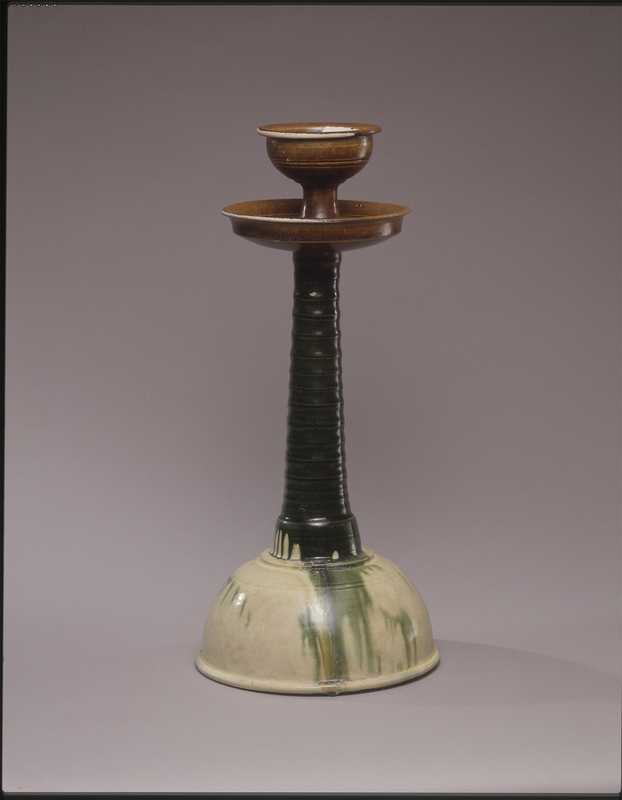 The standard ceramic and metal lamps produced during the Tang dynasty, sometimes referred to as a candlestands, were constructed with the tall stems supported not on domed bases as here but rather mounted at the center of flat- bottomed trays. A lamp in the Asian Art Museum of San Francisco, one of the very few known examples today of the present rare form, differs only in its color scheme.1 What most of these lamps, however, do have in common is a pinnacle cup which would have held oil and a wick rather than a wax candle. Earlier metal examples, however, are fitted with prickets that would support candles, a method of lighting that, in fact, originated in China by the time of the reign of its first emperor, Qin Shihuangdi, in the 3rd century B.C. 1. See He Li, Chinese Ceramics: A New Comprehensive Survey, the Asian Art Museum of San Francisco, San Francisco, 1996, no. 165.